Welcome to our charming log cabin called 'Honeymoon Hideaway'. Honeymoon Hideaway is an ideal log cabin for your special Smoky Mountain honeymoon or your romantic Pigeon Forge getaway. You will love the secluded feeling of the cabin, and enjoy the quick drive to the parkway in Pigeon Forge. There are 4 other cabins on this quiet dead end street, but the cabins are staggered with space in between each. There are no cabins across the street from ours, it's a wooded view. In just 7 minutes you can drive from the cozy log cabin to nice local restaurants, Kroger's grocery store and all the action along the Pigeon Forge parkway! ~ Convenient one-level cabin floor plan. There are just a few easy steps from ground level to the large, covered wrap-around front porch and cabin's front door! ~ High Speed Wireless Internet, Cable TV, and two (2) Flat Screen TVs!!! Low slung vehicles may have trouble when turning onto our dead end street. The road dips down quickly. Due to this we caution potential guests with low riding cars and trucks to take this turn slowly. Motorcycle riders may have trouble with the quick dip when turning onto the cabin's road, plus there is due to the gravel road at the bottom of the hill. ~ The cabin also features a spacious, level yard with a plush lawn. A great place to play a game of with ball with the kids or walk your dog. ~ Other special features are architectural: the soaring cathedral ceilings in the living room, the fabulous exposed wood beams, lovely stained glass windows, and fireplace that can be enjoyed from the living area and the cozy, master bedroom with fabulous king-size log bed! The living area is roomy and open, with high wood ceilings, wood floors and walls! The living area also features fireplace, flat screen TV with cable channels, WiFi, comfy sofa that converts to a queen-size sofa sleeper, and 2 doors to the huge wrap-around porch with private hot tub, rocking chairs, and swing! 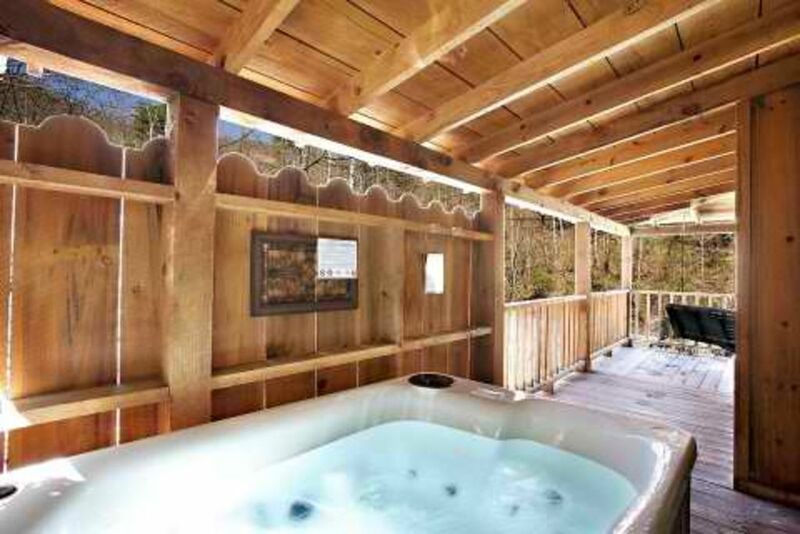 From the porch and hot tub, you will enjoy beautiful wooded views and the privacy of the surrounding bluffs of the Smokies. At ground level you will find a sturdy concrete patio table and benches plus a charcoal BBQ pit. Back inside the cozy cabin, the charming master suite features a romantic, handcrafted king-size log bed with a plush, comfortable mattress, plus a 2nd flat screen cable TV, walk-in closet, and en suite bathroom. Our cabin's mountain setting has easy access to the Pigeon Forge parkway, shopping and restaurants, plus it's just a quick 25 minute drive to downtown Gatlinburg, the Smoky Mountain National Park and Ober Gatlinburg ski area and amusements. The cabin also features high speed internet, a well equipped kitchen and a cozy dining nook with seating for 4. During your stay, you will LOVE the bubbling waters of the new hot tub on your very private wrap-around deck. Sit back in the hot tub, soak your tired muscles, and enjoy the sounds of the mountains - the fresh mountain breezes, chirping of the crickets, rustling leaves of the trees, and the peaceful quiet of this secluded cove. The lovely wrap-around porch is a great place to relax and enjoy the mountains from the private hot tub, the 2 delightful wooden rocking chairs, and the 2 person swing! Located in a lovely 'holler' on the Wears Valley side of Pigeon Forge, you will be only about 10-15 minutes from the 'action' of downtown Pigeon Forge, but far enough out to enjoy the mountains. Have you decided that the delightful and romantic Honeymoon Hideaway is the ideal log cabin for your Smoky Mountain vacation? If so, don't wait -- book Honeymoon Hideaway today! You will love the convenient location as well as the secluded feel of the cabin. Just 7 mins to the Pigeon Forge Parkway and all the attractions and restaurants. Our log cabin is surrounded by mountain bluffs, hence the community name 'Bluff Mountain Acres'. The cove, or as the locals say 'Holler', that surrounds the cabin gives it a cozy, peaceful feel. Romantic, Private Log Cabin. The cabin is located in a secluded cove with mountain bluffs in all directions. Enjoy the very private, covered hot tub and the large wrap-around porch. Guests also love the comfy, handcrafted King-size LOG bed! This is an ideal cabin for guests on their honeymoon, celebrating an anniversary or engagement or those guests just looking for an affordable, romantic Smoky Mountain getaway. Cabin is surrounded by the bluffs of Bluff Mountain. Honeymoon Hideaway is located in a secluded cove with just 4 other cabins. All cabins are staggered for privacy. One cabin is within view. Linens and towels are provided at start of guest stay. There is a laundrymat nearby if you need to wash clothes or the linens. Ski, snowboard, tubing and ice skating at Ober Gatlinburg ski area and amusements! Honeymoon Hideaway is not a good fit for people with motorcycles, mostly due to the gravel road at the bottom of the hill. Please ask us about this if you have any questions about suitability for your vehicle. Our family of 4 had an amazing stay at this cabin. It was everything we had hoped for. We will definitely be booking with this company in the future. Thank you Douglas for the 5 star review!!! We love to hear you had a great family trip! So glad you could make great memories at the cabin. Please stay with us again and use our repeat guest discount. Overall i was very disappointed with my stay at this Property. My biggest complaint was the Jacuzzi motor was loud. This motor had been reported as loud by the previous tenants. The repairmen showed up at 6:00 pm on our last night there. We told them that we would be checking out the next morning and they could return then to repair it. Second issue was the toilet would not flush. Every time that we used the rest room we had to take the back of the tank off and play with the tank float. Third, our granddaughter who was with us was taking a bath when the water started spitting out brown bottom of the tank gunk. Yes, we have pictures of the event. Again, overall we were very dissapointed. Our weekend away from all of our problems just escalated into dealing with more problems. I'm very sorry you were disappointed in your stay and we appreciate your feedback. I wish you would have called to report those issues so we could have handled them promptly. We always answer the phone and take pride in our service and your stay. As soon as the hot tub issues was reported we ordered the part and had repaired. We would love for you to stay with us again and use our repeat guest discount and give us an opportunity to see we would take care of any issues that would have been reported to us. I rented this cabin for a Valentine's weekend getaway with my wife. This is a great cabin. The location is far enough away from the hustle-and-bustle to feel like you're in a remote location, but close enough to everything to not have to travel far. There is a gas fireplace that heats the space nicely, a private jacuzzi, and the bed sleeps well with nice big pillows. The wraparound porch is great, with a swing and rocking chairs to just enjoy the mountain air. The bathroom / shower is nothing to write home about, but functional. Some of the amenities are a bit dated, but they fit perfectly with the ambiance. We would definitely book her again in the future. Thank you for the 5 star review! We are so glad you enjoyed your valentines get away. We would love for you to book with us again. Cute and Cozy cabin great for a weekend getaway. Close to everything and easy to get to. Road can be a little tricky at night but overall great place to stay. Loved that it was Pet Friendly and allowing us to bring our four legged friend with us. Thank you for the 4 star review! We do appreciate all of your feedback. We are so glad you have a great weekend getaway! Please stay with us again and take advantage of our repeat guest discount. Thank you for the 5 star review! We are glad you enjoyed your stay very much! We would love for you to stay with us again and take advantage of our repeat guest discount. Had a wonderful time at Honeymoon Hideaway! Perfect for a relaxing weekend with the hubby! Thank you for the 5 star review! We are so glad to hear you has a perfect relaxing weekend away with your husband. Please stay with us again and receive a repeat guest discount. So glad you enjoyed the cabin!